A section of the woods around our family’s country house shelters countless wild blueberry plants that bear fruit mid- to late-August. Like many of our neighbors, we plan a yearly wild blueberry picking expedition: hunting down the plants and filling up containers of fresh wild blueberries always feels like we’re getting away with the loot. Wild blueberries are so delicious and potent in flavor! We eat a lot of the berries fresh and by the handful, but we usually have so many that I can save some for baking. I throw them into quick muffins and easy financiers, or I make more elaborate desserts with them, such as gelato or pie. I also always make sure to freeze some for later use, a habit I think everyone should pick up. No need to have a blueberry patch closeby! 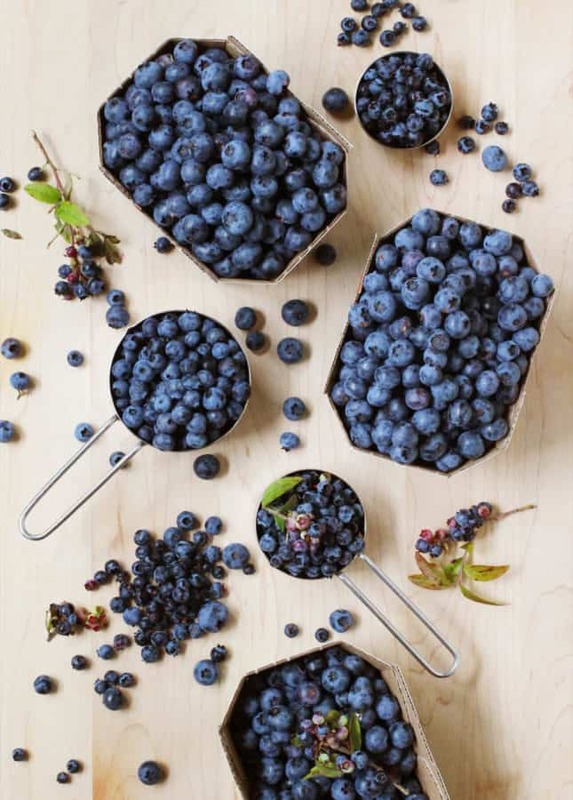 Buy baskets of wild blueberries while they’re the cheapest–from mid-August to mid-September, usually. At home, spread them in a single layer on a baking sheet, freeze, then transfer to ziplock plastic bags. 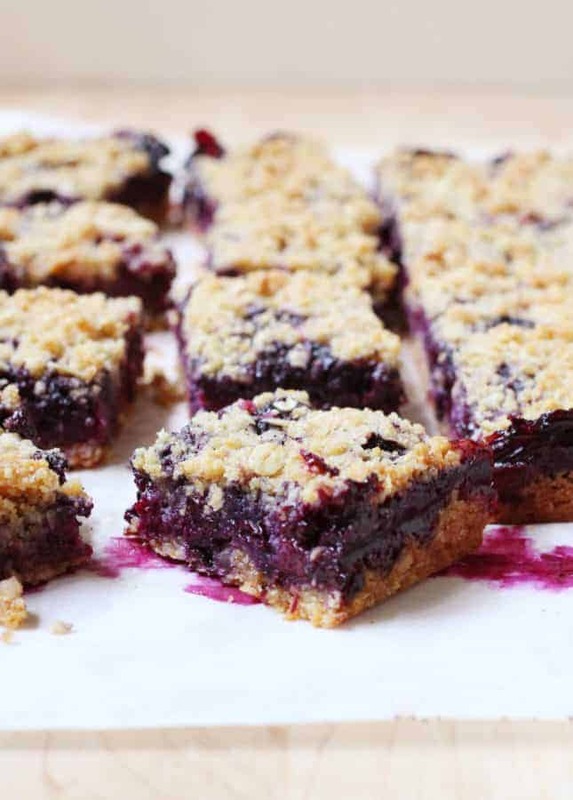 This simple tip will lead you to a winter full of blueberry treats! In this twist on traditional oatmeal cookies, I use wild blueberries straight from the freezer. Not only is this quick and handy, but it allows the berries to hold their shape while you fold them into the cookie batter. Oatmeal cookie batter gets quite stiff so fresh blueberries would simply turn to mush if you tried to incorporate them as is. In these wild blueberry cookies, the berries replace raisins for an exciting result: after baking, the wild blueberries become jammy, adding richness to an otherwise unassuming dessert. The sweetness of white chocolate complements the blueberries really well, but you can substitute these for dark chocolate chips for an equally delicious result. 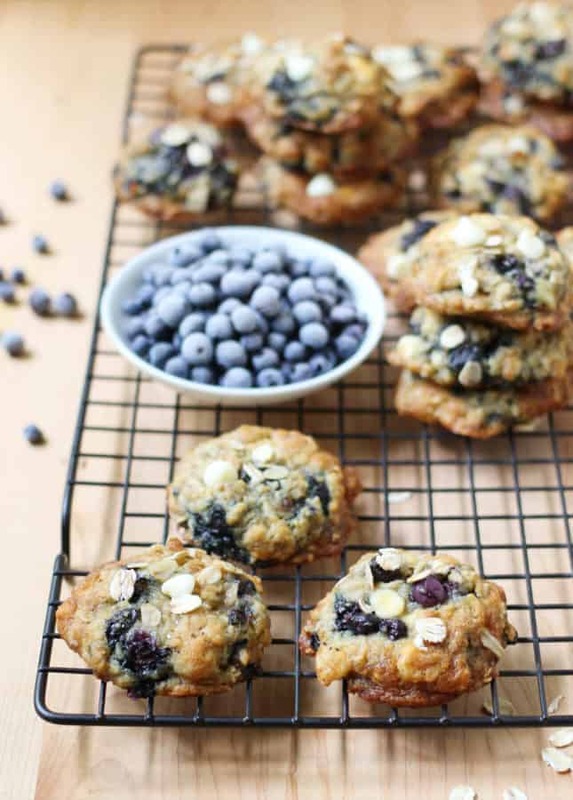 These Oats, White Chocolate & Wild Blueberry Cookies are a twist on classic oatmeal cookies: blueberries replace raisins to create a super flavorful treat. Using a stand mixer, or a hand-held mixer, beat the butter until fluffy. Add the sugars, then beat until fluffy, about 2 minutes. Beat in the eggs, one at a time, then beat in the vanilla extract. 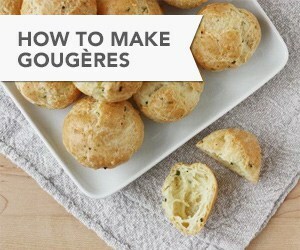 In a mixing bowl, whisk together the flour, salt, baking soda, ginger, and nutmeg. Stir the dry ingredients into the butter and sugar mixture. Stir in the oats. Using a spatula, fold in the frozen wild blueberries and chocolate chips. Make-ahead tip: Using a medium cookie scoop (1 1/2 tbsp/22 ml capacity), pre-portion the dough and set the cookie mounds close together on a baking sheet or dish. Freeze until solid. Transfer to a plastic ziplock bag, and keep frozen until needed. This allows you to bake only the quantity of cookies you need, and to enjoy freshly baked cookies more often! The frozen, raw cookie dough will keep for up to 2 months. To bake: Preheat the oven to 350°F (175°C). Line a baking sheet with parchment paper. 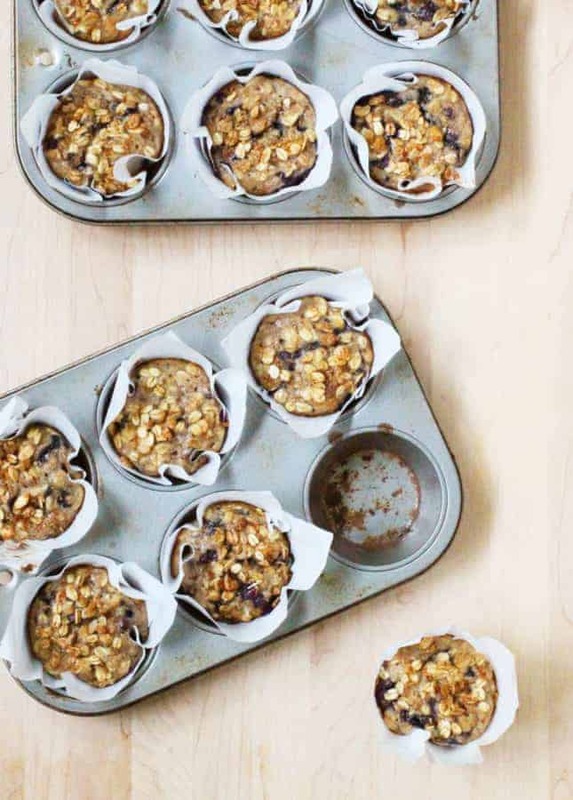 Using a medium cookie scoop (1 1/2 tbsp/22 ml capacity), portion the dough and set the cookie mounds 2 inches apart on the prepared baking sheet. Bake until the edges of the cookies are golden and the center is puffed, about 10 minutes. If baking from frozen, bake for 15 to 17 minutes. At the end of the cooking time, the centers will still be soft, but they will firm up as they cool. Cool the cookies completely on a wire rack. 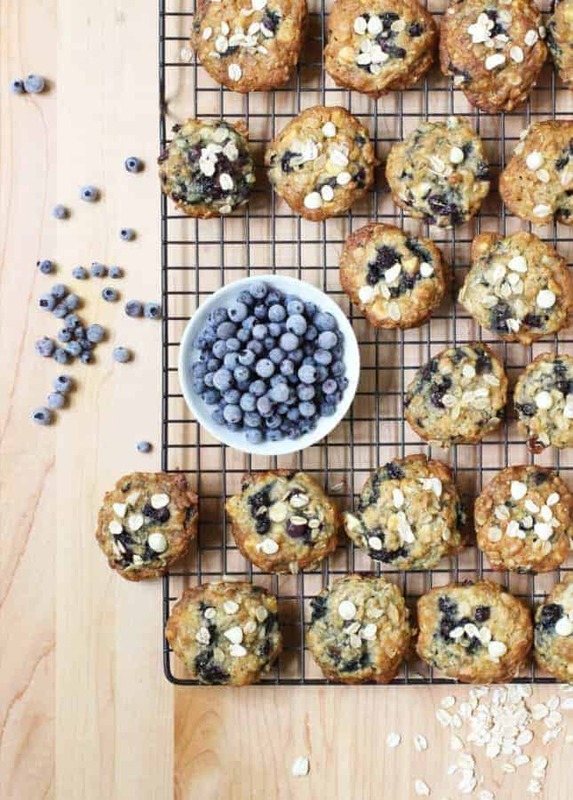 Because the cookies contain fresh blueberries, they will soften quicker than regular oatmeal cookies. I recommend you to bake only the quantity of cookies you need and keep the rest frozen, so you always get to enjoy the cookies freshly baked. If there are leftover cookies, store them in an airtight container at room temperature for up to two days. 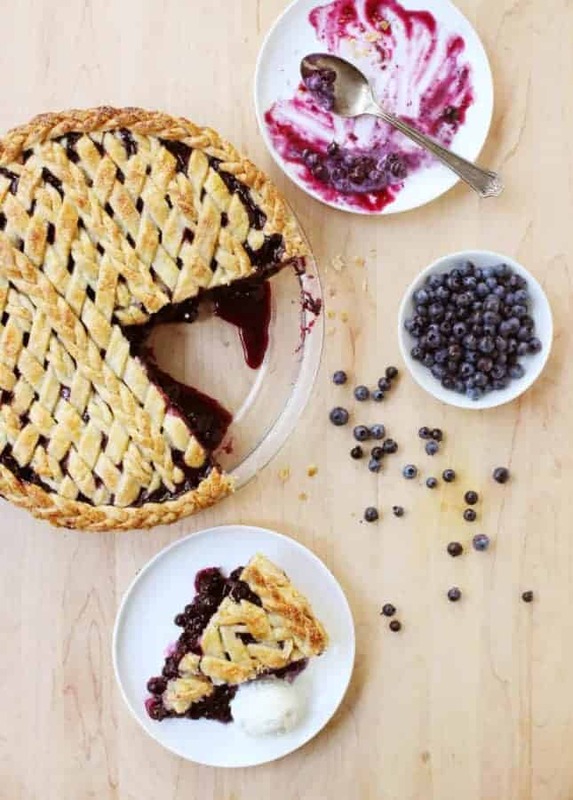 This recipe works best with wild blueberries because they’re smaller, more concentrated in flavor, and contain less water than regular blueberries. Using regular blueberries may make the cookies too soft. Adapted from Melissa Clark, The New York Times.